WOW March on Maui sign. The group of WOW March on Maui marchers definitely takes me back to my college days… hanging out with the environmental club and tabling people to boycott grapes sprayed with pesticides or going to environmental conventions with long-haired hippies. The turn out for the community open forum potluck was decent considering that the Temple of Peace was hosting a kirtan (spiritual chanting) for a distinguished guest followed by a vegetarian potluck. WOW March on Maui Haiku potluck. At 5:30 pm at the Haiku Community Center, the event was not underway yet (the sign said 5 pm), and bright-eyed activists were taping up Balinese style posters and flowerchild 60s style bus pictures. We ended up going back home and came back at 6:30. The potluck was well underway, meaning the salad was totally wiped out and there were several empty dishes. There was a spoonful of black beans in one bowl, and a large pot of curried vegetables and a big soup pot still full of soup. It was a typical Maui style potluck, meaning it didn’t start on time, and once it started, the food goes fast. TIP: if you are hosting a potluck or dinner, always tell people to come by an hour earlier than you would like them to. They will inevitably show up an hour later, which is the time you really wanted to start serving food. However, if you want to be on time, tell them you are on “mainland time.” For some potlucks, I like to eat ahead of time because it makes life easier. Potlucks on Maui really depend on who is hosting the potluck. If it’s a community organization or public potluck, food tends to go really fast and become very sparse. If it’s hosted at someone’s house with limited numbers of people, food tends to be more plentiful. Since the Venus transit was also going on that day, and we had skipped the big event at Blue Mountain’s that afternoon, we brought over a welder’s mask and invited some folks to look at the sun through the mask. There was a small dot on the lower right corner of the sun. Very small. That was Venus. Emily Athena Clarity, which is a good name for a Maui activist, wore a bright yellow tank top with the letters in all caps: WOW over a rainbow over the words MOM. So if you didn’t know it was a March on Maui potluck, it would be a great top for a Maui mother’s group. She took the podium and announced that they are gathering signatures for a petition to take to the county building in Wailuku regarding aerosols sprayed in the atmosphere. Essentially the point of this march is to publicize the issue of chem-trails while also providing useful community information on other topics. One of the marchers said they were going to show an excerpt from “What on Earth are they Spraying?” a documentary about chem-trails and geo-engineering of the air. I actually haven’t seen this film. I probably ought to see it, and I know it’s been aired several times on island already, but I’m waiting for the documentary on cane burning to come out. Another activist also said it’s not just chem-trails from a plane (that is so old-school), but aerosol explosions above the ocean that eventually drift residue to Hawaii or other places. WOW March on Maui organizer Emily Athena Clarity with fellow marchers. Emily Athena Clarity announced that there would be mini-forums or groups at different tables: including the gardening group, the chem-trails or aerosols group, and the health and vitality group. I don’t recall the fourth group. DH and I decided to spend time with the health and vitality group run by Petra. She was terribly enthusiastic like a jogger with a timer. Petra disclosed that she is a raw foods advocate, saying that cooked foods reduce the water content in foods, and cook out the nutrition in foods. She added a disclaimer that a raw food diet is not for everyone, but even for a short period of time, can add a lot of vitality to one’s life. She was preaching to the choir, since most people there were partial to the raw food lifestyle, as evidenced by the empty salad bowl. Petra said the best water for the human body, the water that “we are designed for” is not bottled or treated water, but water fresh from a spring, bubbling out of the ground. She says she gets her water from 2 springs in Kipahulu, but didn’t know of any other springs on island. She suggested asking locals. Well, I can’t imagine any born and raised Mauian revealing artesian spring locations to the rest of us transplants (even if only from Oahu). But maybe I need to expand my thinking and be more optimistic. There is the I’ao valley which has very good water, and was even recommended by my doctor who said some of his patients have gone there for years to get water from the spigots in the park or by the side of the road. We did get water for a while from I’ao, but it has to be used right away. It can’t sit more than a day. Otherwise, it starts developing a greenish tinge. Even after putting in several drops of GSE – grapefruit seed extract – which supposedly is very antibacterial – it still gets nasty. DH and I talked with a county worker at I’ao once and he said the only treatment the water gets from the spring is it gets a UV treatment. No chlorine. But we don’t live near I’ao. DH mentioned the environmental cost – not to mention the fuel cost – of driving back and forth to I’ao or Kipahulu to get fresh spring water is prohibitive. So, the next best thing according to Petra is getting a good water purifier – something that can filter and alkalinize the water. She says that tap water here is terrible, and from what I’ve heard about injection wells and agricultural run-off, am inclined to agree with her. At home, we use a bare bones water purifier, not electrified, just a filter, although I’d love to amp that to a better system. Petra said on waking up, drink a big glass of water with a good squeeze of fresh lemon juice. I prefer adding a splash of raw organic apple cider vinegar in my morning glass of water. It’s also alkalinizing, and my body responds to the raw apple cider vinegar more than to lemon juice. I had a sore in my mouth once and the first day I switched to raw apple cider vinegar in my water, it went away. It seems strange that drinking something acidic like fresh lemon juice or raw cider vinegar would make the blood more alkaline, but from all I’ve read, that’s how the body works. I tried drinking 16 oz of water today upon waking up, and just felt really bloated – so I’m going back to my “normal size” glass of water. I try to take health information with a grain of salt. Often it’s good, sometimes it’s not great. Mostly you have to try it out on yourself and see if it works, meaning improves your health. Petra said that humans are allergic to wheat, soy, and dairy. I’m pretty sure those were the three big allergens she mentioned. I have plenty of gluten free friends and I think wheat is generally over processed, but is everyone allergic to wheat? I don’t know. And soy? Are all people allergic to soy? And yes, I agree that most soy is also over processed. And dairy has a host of detractors. Maybe Petra didn’t say everyone but that’s how I heard it. In any case, I mostly listened with an open ear, agreeing with some of what she said and silently questioning other things. There wasn’t enough time to discuss things, when she was clearly trying to work within time limits. Petra also talked about making a veggie smoothie or a veggie drink. She confessed she doesn’t like to use the juicer – it takes time, and needs to be cleaned. No kidding – I juice once a day religiously, and it does take time washing, juicing, and cleaning up. She is like many friends of mine, a believer in the almighty Vitamixer, and says she’ll throw a big bunch of greens like kale or parsley, spinach, lettuce. She said spinach is a little easier to digest than kale until the body gets healthier. P.S. Organic spinach is better – conventional spinach is known to be high in pesticide residue. One of the guys next to her, who looked like a born and raised Mauian, said that he did get burps when he first started drinking veggie smoothies, but they did go away. The burps indicate the body having some difficulty digesting the green stuff. Petra said that she will use fruit, just enough to make it taste good – she loves using oranges, mangoes, pineapple, all the good local fruits that are so plentiful here. She said initially we may like the smoothie sweeter but after time may enjoy using less fruit. It’s for each person to decide. She recommended against watermelon and the melons saying the fruit needs to be strong enough to mask the flavor of the greens. Petra also mentioned that ape DNA is 99% the same as human DNA – and the ape diet is mostly fresh greens and sometimes the apes will take some fruit and wrap it into greens and eat it. I can’t verify this point but it’s worth noting. I have read other research that says apes also eat raw meat from time to time, and most of us don’t do that either – except for people who like steak tartar or sashimi or shrimp ceviche. Mini forums at WOW March on Maui Haiku potluck. Petra said she doesn’t like using soy at all, not soymilk, not tofu, not tempeh. She’s dubious of soy’s benefits and is one of those who believe that soy causes excess estrogen production and is harmful for the body, and mentioned concerns about where soy is grown and how it is processed. On the flip side, I have read that phyto-estrogen from soy is actually beneficial for the body. It’s confusing to say the least. Petra also talked about making veggie drinks instead of making veggie juice through a juicer. Take a blender or a Vitamixer if you have one, add some good water and greens. Some lemon juice is great too. Blend it all up and then take a nutmilk bag, a large-mouthed fine mesh bag that Mana Foods sells for about $8 or so, and squeeze the greens through the bag into a bottle or a glass. Discard the squeezed greens and enjoy drinking the fresh veggie drink the rest of the day. Both the veggie drink and veggie smoothie are transportable. As we were getting up to leave, to spend some time at the gardening talk story, Petra wanted to rapidly go over her 3rd point. She said that raising one’s legs off the ground while doing #2 helps close off a valve in the intestines which makes it much easier to poop and will push out more poop from the body. She said that poop is only about 20% of what we eat – the other 80% is dead cells that our body is eliminating. By raising one’s feet off the floor, this facilitates a good bowel moment. Petra mentioned that all the big name health spas have specially designed toilets or foot ramps designed to raise the feet off the ground. When she said this, I thought about Shelley St. John’s colonic practice at the Temple of Peace in Haiku – Shelley also has a special toilet ramp. Somehow, I never connected simply doing this at home as well, by keeping my feet a few inches from the ground. . I have done a lot of cleanses and healthful practices, and have no complaints about my bowels, but it never hurts to do a better poop. So I’ve tried it – duh, why not? – and yes, it does make a difference. Petra said if you are only pooping once a day, this may help you to poop twice a day. Or if you are only pooping a certain amount, this will help get more of the poop out of your system. I do agree that it’s good to have healthy intestines – a lot of health problems are connected to the junk stuck in our intestines, and better pooping means less weight and fewer inches around the tummy. As for allergies, Petra recommended getting bee pollen from Mana Foods and adding it to other foods. Plus she said to avoid soy, wheat, and dairy. Anyhow, DH and I felt full of information and went to the tail end of the gardening forum, run by Evan Ryan who is on the board of the Maui Farmer’s Union and another avid gardener, whose name I didn’t catch. We talked about pulling out kale that has little eggs underneath the leaves, probably aphids. Evan said that without winter, plants here can live a long time, much longer than they would otherwise live in other climates. So it’s easy to allow plants to live that really ought to be yanked out of the ground. He said kale could live for years even, just producing less and less and getting more and more sickly. Evan also mentioned some permaculture gurus including Bill Hollison and David Holmgren and Rosemary he-couldn’t-remember-her-last-name – probably Rosemary Morrow which google has readily provided. WOW March on Maui schedule. The march is continuing through Friday, with more potlucks, rallies and community yoga. Today (Thursday) there was a big rally at the Monsanto headquarters in Kihei. The march is definitely a Maui-esque event. 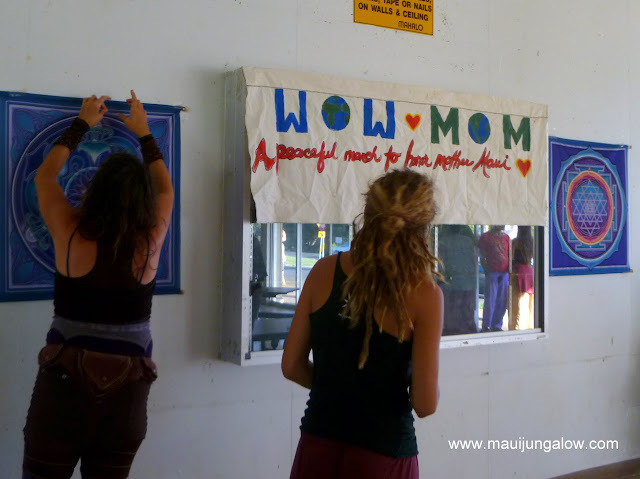 Not the Maui of tourists or local boys or surfers, but the Maui of hippies, consciousness seekers and community activists.